Fiat Cross(c)over is a sports cross-over concept, a mix of SUV and coupé, all based on the Dodge Caliber platform. The idea was to create a versatile car for all purposes, that also allowed a light hearted daily usage. 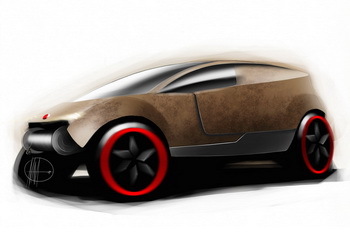 The Fiat Campagnola project proposes an exterior for this vehicle, designed for an off-road use, which has a body covering that is made up of multiple leather layers. Last week Fiat outlined in fine detail how its future plans would be wrapped tightly with Chrysler's and how the two carmaker's brands would join forces in every area; meanwhile the students of the "Transportation Design" course at the Istituto Europeo di Design (IED) in Turin are at the same time busily presenting their own visions of how the fusion of these two distinct design languages could play out in the coming years, taking the traditions of both carmakers to come up with distinctive new ideas. The students of the IED were in fact quick to embrace the changes: when the idea of Fiat and Chrysler joining forces was first mooted in January, the 37 members of the 2008-09 course took a hold of the subject a month later with the rapidly unfolding scenario leaving them open to new thinking as they were starting from a blank piece of paper without reference points, a fresh subject but one that also would pose a tough undertaking. Two of the students' projects were detailed by the IED at the end of last month: "Biov" by Roberto Testolin, envisioned a small ecological, cheap to produce car that would have a very low environmental impact as it would be manufactured out of light plastics meaning it would be low-cost to manufacture while a series of overlapping components that will reduce the assembly cost further. Meanwhile the other project to be taken a step forward is "Jeep PYGMY" by Vasiliy Kurkov, a small car is based on the Fiat Panda Cross 4x4. Now two more projects have been detailed further this week, this time studies that bring the Chrysler Group's traditional values to the Fiat Group: Fiat Cross(c)over and a new Campagnola. Fiat Cross(c)over is a sports cross-over concept, a mix of SUV and coupé, all based on the Dodge Caliber platform. The idea was to create a versatile car for all purposes, that also allowed a light hearted daily usage. The body is completely built out of flexible materials in order to replace the Caliber's sheet metal. This means greater lightness, any blows to the bodywork are softened without damaging the exterior (thus avoiding substitution or repairing problems and costs), ease of assemblage by using magnetic clips, less splits and elements thanks to the flexibility of the materials. 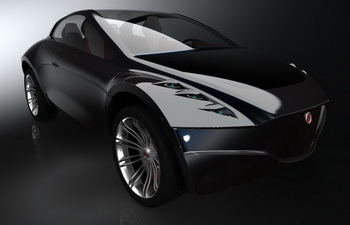 The second project builds on the Chrysler Group's best in-house card: Jeep, and proposes a Fiat New Campagnola. The exterior of this vehicle which is designed for an off-road use has a covering made of multiple leather layers. To avoid the use of hinges the students employed different skin thicknesses to obtain a linear bending of the skin where necessary. From the rear of the roof top and the sides removable sections are contained in several separate spaces. These sections can be extended to slot together into an awning, assembly being within a few seconds, offering the vehicle user weather protection and privacy. The front is dominated by a useful embedded winch. Meanwhile the materials used inside allow the creation on the door panels of some warm tissue flaps that can be used to cover the occupants or used as arm-rests.